This is one of my favourite apps mainly because it involves time and alternative ways of representing it. While binary clocks may well be something of a cliché around the internet they do get quite boring. My one, however, is slightly refreshingly different. I do not consider other clock to actually be binary clocks. The reason being that they still represent the time sexagesimally with divisions between hours minutes and seconds with the digits of sexagesimal even represented in decimal before the individual decimal digits are then represented in binary. Not very binary at all I think you’ll agree! The way my clock differs is that it is completely binary. Yes pure base 2, no other number systems at all to represent the time of the day. Firstly the time is represented by dots being either on or off. These dots have been arranged in a circle to bring some familiarity to the clock. 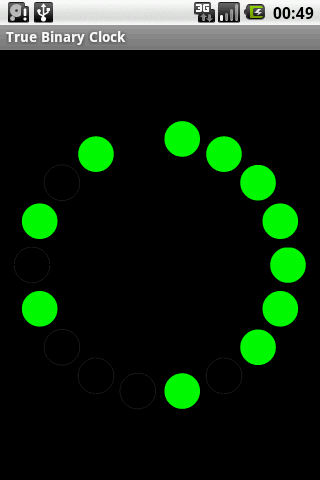 The dots are of increasing size starting with the smallest at the top and going round in a clockwise direction. This means the last and biggest dot represents half a day; followed by a quarter of a day represented by the penultimate dot and so on; leading down to the smallest dot, the 16th, representing 1/65536th of a day. This number of dots was chosen because not only is 65536 a double power of two (2^(24) and that’s nice) but because it is the closest to the number of current seconds in the day (86400). The more astute among you will already have noticed that the smallest denomination in this system is actually slight longer than an old second (about a third), for the rest of you I hope that you are now following. Of course an extra dot could be included to distinguish a 1/131052nd of a day but who really wants to live their life at that pace? I have posted a download link for you to try it right away on your Android phone. You will of course need to allow installation from non-market sources. If asked or I get around to it I may add a snazzy 2D barcode to make it easier to download the app quicker and easier.